We passed our electrical rough-in inspection on Tuesday. My helper Nacho and I started right away hanging the drywall and we finished the tape and float on Friday. 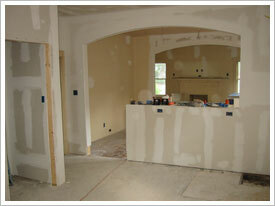 You can really start to see how the new kitchen is going to look and it’s exciting. All the “old house smells” are now gone as the walls are all sealed up. Additionally, I put in a new back door on the kitchen and a new sub floor in the bath. My A/C guy is coming Tuesday to start running all the duct work and install the furnace in the attic for new central air conditioning. I originally planned to place the compressor on the side of the house so I had the electrician run the power there, but after pulling the permit we were advised that since we are in a historic neighborhood we couldn’t have the equipment visible from the street so I decided to put it in the backyard. Another neighbor stopped by today to tell me how happy she was to see someone finally doing something with this old house.